This homey little kite altitude record page has a similar format to the old kite flying log. In fact, most of the entries here were taken from the flying log. If more than one kite was flown on the day, I edited it down to just feature the record-breaking kite and its flight. As you will notice, all this is quite old now - so there's no mention of Dowel Series kites, or Soft ... or Paper ... Heck, I don't think even the Skewer Series was complete! 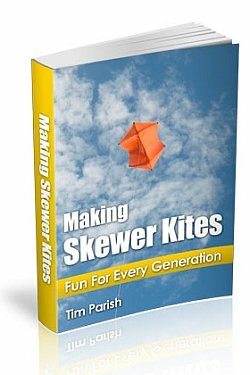 The Making Skewer Kites e-book was published soon after the 2-Skewer Dopero had proved itself in flight. Bamboo BBQ skewers are generally bought in packs of 100, so these kites are exceptionally cheap to make. Comments: We thought we'd try a new flying ground today, after checking out all the nearby reserves in the street directory. A short drive away, we parked the car and headed over to the reserve next to Reynella Primary School. Even before we got through the tree line surrounding the park, it was clear that we had found a very good spot for kite flying! In no time, I had the diamond out but had trouble hooking in the paper clip. Thanks to advancing age and no reading glasses... May did it for me, then started the photo-shoot while I test flew the kite close to the ground. After a while, I took the camera and by some fluke took a fascinating shot of the brightly back lit kite hovering over our little son like an angelic being. Once we had plenty of shots taken, I headed out towards the center of the grounds, letting the diamond take out line at a great pace. 50 meters, then 100 meters, and the kite was flying beautifully. With the fresh breeze up aloft, the kite showed signs of wanting a more forward attachment point, but still flew around the 45 - 50 degree mark. With the late afternoon sunlight glinting off its fluttering shoulders and brightly illuminating the snaking tail, it was quite a sight. Quite a satisfying sight actually, since I have been painstakingly documenting and photographing its construction for a few days! Newsletter subscribers will find a link to the relevant page on the website at the end of the month. With the extra room available in the reserve, I let out another 50 meters of monofilament. So finally, the little diamond was just a dot in the sky with the ripples in its bright shimmering tail making it a bit easier to spot. It managed to reach about 45 degrees, with a line angle from my hand of about 25 degrees. It might do better with the bridle adjusted better, but 150 meters is a lot of line for such a small kite. I might eventually try it on even finer line. So, here's the calculations for its height. I quick look on the Web brought up a diagram which told me that the line sag I had today would correspond to about a 4.5% error in altitude. OK.
Let's round that up to 102 meters, I'm sure line stretch would account for that anyway. A new altitude record, more than doubling the last one! That 45 degrees was just an eye-estimate. However, we will be more accurate from now on, as we just went out and purchased a small protractor. By hanging a small weight from its center, we will be able to sight the kite along the top edge and then read off the angle from the scale, to within half a degree or so. No more doing just a rough guess to the nearest 5 degrees! Comments: Plenty of wind about, so Aren and I went down to the reserve. In the ample breeze, the delta was soon laying out line into the sky. Being a bit tricky in gusty wind, it ended up on the ground a few times. Nearly every time, I managed to relaunch without walking out to it, as described in an earlier log entry. Finally, it was nice and high and I let the reel spin out to just past the 50 meter mark, let's say 51 meters. As I hoped, it got up to a very high angle once or twice. With the help of some thermal activity I'm pretty sure. That was the altitude record broken, simply due to the very high line angle which I estimated to be about 70 degrees. With not much sag in the line at all I might add. Let's see... calculate, calculate ... that means the kite was about 48 meters off the ground, not even allowing for any line stretch! When the wind got a bit strong from time to time, I discovered another of its characteristics. It would start to loop very tightly, with its 4 meter tail forming a 3 or 4 loop corkscrew shape. Seems like when it got like this, the tail wasn't doing its job very well. The fix was to walk quickly toward the kite to de-power it completely. Then it would recover and race away in one direction or another, before eventually climbing high again. Maybe using 2 or 3 shorter tails instead of one long one will fix this looping problem? Definitely something to try later! It's easy to change tails on MBK kites. Comments: After the wind picked up a bit out at the reserve, we cracked out the skewer diamond kite. Things got a bit hectic with toddler Aren trying to get in on the action. On top of that, a very enthusiastic 11 year old boy tried to 'help' me, as they do. He also knew more than me, as they do ;-) Funny, he kept holding the kite up-side-down every time I went to launch it... While the wind was still a bit on the light side, with turbulence swirling past the trees, the result was a few short flights. Eventually, we got some slightly better air a few meters up and the little diamond was happily unreeling the 3 kg fishing line from its reel. 'Cool!' said the kid. I think a smile must have crossed my face as I realized the first 50m marker I attached to the line a few weeks ago would soon appear. Yep, there it was, and I decided that was enough. Much more, and there just wasn't enough space in the reserve, should the wind drop suddenly. A tree landing would be tragic. The kid pretended to do aerobatics by swishing the line around. The kite would do the occasional loop, in response to the sudden increases in its airspeed. With 50m of line out, I was pleasantly surprised to notice that there was very little sag in the line. The difference in angle between where it left my hand and where it attached to the kite would have been less than 5 degrees. That means this little kite is going to go a lot higher when we take it somewhere with some more room to move. One problem, though. With its small size and construction from see-through freezer bag plastic, including the tail, it was nearly invisible against white cloud, just 50m out! We might have to add some brightly colored plastic to the tail, just to keep it in view. 24 minutes after launch, the kite was on the ground again, after the wind died down completely for a few minutes. I ended up at the foot of the trees on one side of the reserve, winding line onto the reel as fast as I could. Best flight yet for the little diamond kite. Comments: Wintry day, cool wet weather. Strong breeze up higher, but lots of turbulence down low due to large trees. The little sled had a wild ride. Saw the effect of large-scale wind swirls from the trees. That is, large changes in direction, sudden climbs and sudden descents, all with plenty of pull on the line. It was still pointing straight up during those descents! At other times it did loop and dive due to really strong wind pressure. Plus a little thermal activity due to sunny patches opening up once in a while. The long tail floating up behind the kite. Reached the limits of this kite on its standard cotton line! Reached a maximum of about 50 degrees from horizontal. I could have probably added a meter or so of line stretch due to the strength of the wind, when calculating the max height. Wondered if something might snap actually, I guess one day we might lose it! Comments: Best day yet to fly the little sled, although the gusts kept putting it into unstable spins. Ended up on the ground a few times. Eventually got all the line out, that's 18 meters (60 feet) of stretchy cotton, with the kite up at just over 30 degrees. If it had stayed stable a few seconds longer, it would have reached around 45 degrees, we've seen it do it on shorter line lengths. To break this record, we might add some more tail and try some light nylon line. Comments: Just an excuse to get this page started, basically. :-) This was when we had just bought the baby sled, and my wife flew it in the park on our way back to the car. The breeze was so strong, the little sled flew in circles most of the time. Occasionally it would straighten just long enough to get up to a 30 degree angle or so on its short cotton line. We will break this record the next time we go out.